I was riding down a foggy, dark Berkeley hill over the summer thinking, “I can’t see the road! 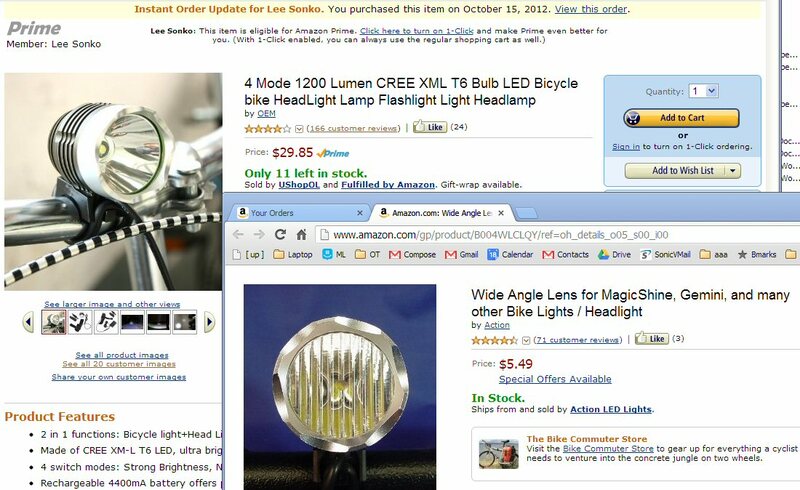 I’m going to get killed!” So I got a bright bike light. I only ended up paying $50 on Amazon and I’m quite happy with it. It is literally as bright as a car headlight! I’ve pulled up at stop lights and the light it cast is comparable to the low beams of the cars next to me. I can see the road! It took a full month to arrive from Hong Kong. But it looks like they are shipping from the US now. You definitely want to get the wide angle lens, otherwise one spot is lit brilliantly and you can’t much see the rest of the road. The battery lasts something like 1.5 to 3 hours. The ONLY problem I have is that it runs full strength until it runs out… which means it could die unexpectedly on the road. So I carry my old 1 watt light when I’m travelling a long distance at night. It isn’t perfectly balanced on my handlebar so when I hit a bump, it jiggles. But it’s pretty good… and just $50! Wait… they lowered the price, looks like it’s $30 + $10 for the lens… total $40!